I recently had the opportunity to join several of the USPTO’s intellectual property (IP) attachés in Long Beach, California, to deliver presentations at the American Bar Association’s IP West conference and meet with local U.S. stakeholders and businesses. The USPTO’s IP attachés, who came here from their regional posts in South America, Central America, Asia, Mexico, and the Caribbean, are U.S. diplomats assigned to embassies or consulates to advocate U.S. positions on IP matters for the benefit of U.S. stakeholders. They are committed to advancing U.S. business interests internationally. They also provide information to U.S. businesses entering foreign markets, including how to navigate foreign laws and protect their IP abroad. In addition to their extensive work abroad, the attachés regularly work with USPTO headquarters and its regional offices to hold meetings and conduct programs with stakeholders throughout the United States. These activities are designed not only to expand awareness of the IP attachés’ efforts, but also provide expert assistance to U.S. industry associations and individual businesses in their efforts to protect and enforce IP rights overseas. One of the highlights of our visit to Southern California was a three-hour roundtable discussion held at the University of California–Irvine’s Applied Innovation incubator, The Cove. It consisted of a series of wide-ranging discussions on global IP protection, and gave about 100 attendees—who represented startup companies, academia, and IP law firms—the opportunity to get answers to their questions about the IP challenges faced by U.S. stakeholders abroad and the best methods to help them. It also addressed several related areas of concern, such as counterfeit goods, patents, and trade secret protection. In addition to The Cove, we also visited other associations and companies while we were in Southern California, including Boeing, Western Digital, The Walt Disney Company, and the Orange County IP Law Association. 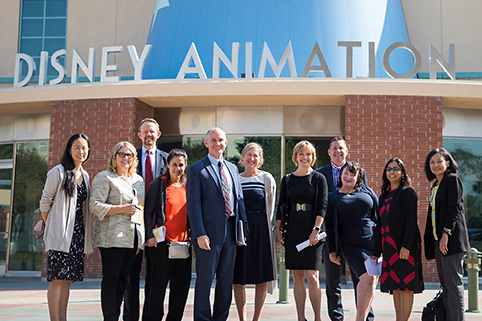 A group of the USPTO’s intellectual property attachés recently met with representatives of The Walt Disney Company in Burbank California. The visit was part of a series of outreach events that the attachés conducted in southern California, meeting over a three-day period with a wide variety of local U.S. businesses and other stakeholders. We are truly fortunate that the USPTO has such dedicated and talented individuals advocating on behalf of U.S. business interests and working with foreign government officials for the enactment and enforcement of strong IP policies, laws, and regulations. In addition to their most recent visit, similar IP attaché outreach programs have been held in other major U.S. cities near or in one of our regional offices, including Detroit, Michigan; Denver, Colorado; and Washington, D.C. The next one, in early December, will be in Dallas, Texas. I urge you to learn more about the work the attachés do by visiting the IP Attaché Program page on the USPTO website.